Panasonic HDC-MDH-1 is a shoulder mount shooting camera shaped for pro-style shooting (professional style). 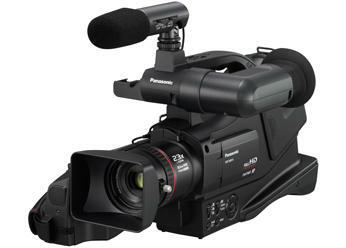 The MDH1 is the entry level camera from Panasonic for professional video shooting. It cam record both Full HD and Standard Definition footage. For HD recording it uses the known AVCHD format and for storage it uses the SD cards (compatible with SDHC and SDXC memory cards). An external stereo microphone is included in the basic kit together with a long life Life 5h 5min battery. Your can read more about MDH 1 camcorder on this panasonic webpage. This new entry level camera replaces the old SD, miniDV model Panasonic NV-MD10000 which was a bestseller for quite a time. You can see a comparison video sample between NV-MD10000 and Panasonic HDC-MDH1 on youtube. Also you can watch a full hd sample from the same user.